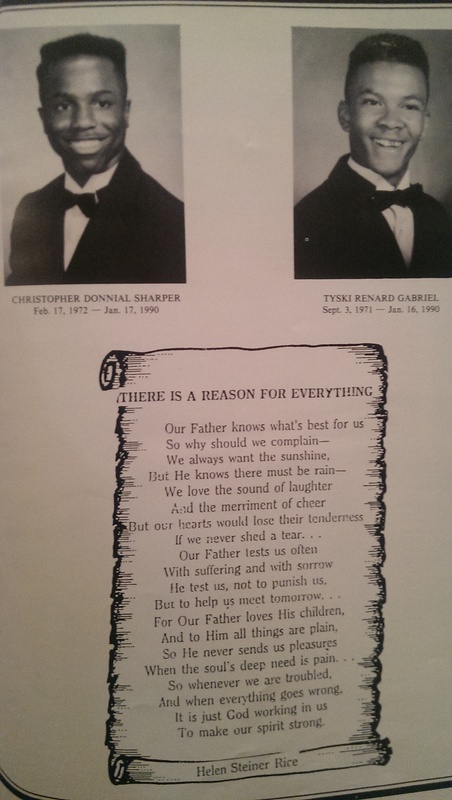 In a couple of weeks will be 25 years since I was approaching my high school graduation and had to face the reality of gun violence that resulted in the death of two friends, Tyski Gabriel and Chris “Punkin” Sharper. In seeing many begin to share their resolution for this coming year, I’ve thought lots about Tyski and Punkin and their families. I try to imagine what they would look like, what their lives would be like, and how things might’ve been different for me. I selfishly wonder what would be different for me because Tyski and Punkin’s death was yet another awakening in my challenging childhood and adolescence. In the days following, several of us adrenaline and anger loaded young men gathered with the goal of exacting revenge on the perpetrators and those who we believed contributed to the fate of our friends. I had withdrawn to deal with my sadness of their death alone and to focus on my part time job and going to college, but received a call from my best friend who told me of the meeting and when he’d come to pick me up. I wanted in and wanted nothing more than to avenge the death of Tyski and Chris. As can be expected, when we met we were poorly organized in how we would retaliate and after lots of talking, scheming, and emotional venting we eventually dispersed. For me I swung between being livid and relieved that nothing happened because I had managed to get a handgun that night in hopes of making a significant contribution and that wouldn’t happen. I would end up being relieved that circumstances didn’t escalate further causing me to use the gun and I was also determined to find some way to honor Tyski and Punkin. After a ridiculous confrontation later in the school year, my principal, Mr. Henry Young admonished me on being a leader and called me out to honor Tyski and Chris by being successful in life and helping others. For the past twenty five years, I’ve thought of Tyski and Chris a few times a year and it’s always stood as a reminder for me to seize the moment, to do my best, and to make a difference in the lives of others. Though I’ve come up amazingly short in my personal life in many ways, I’m at peace that my life to this point has honored my friends as I wanted and as Mr. Young directed. As I look back at 2014, I realize that my work isn’t done and that I have tons to offer relative to improving life for those who are living in situations similar to that I was reared in. After taking a few years off from being highly engaged in community service, I look forward to upping my involvement in 2015. Surprisingly, I also find myself in a position to engage with law enforcement and communities that have historically had low trust for them. After spending most of my life hating the police because of my perspective and how I witnessed them treat me, family, friends, and others in the community, I managed to also spend time advocating for families and seeing more inappropriate and dismissive action by law enforcement individuals which further disgusted me. However over the past three years, I’ve gained a broader perspective as a result of many close interactions that helped me view police officers as people and individuals. I’ve sat on a non-profit Board with a Chief of Police, established a relationship with a different police chief, partnered with police officers to find computer equipment for a non-profit, sat on a police hiring board (that was an odd feeling), played basketball with police officers (couple decent ballers), shot guns at a range with officers (that was fun), and even made suggestions for new cadets. Although none of my interactions over the past few years erase my past experiences with police, I have gained a level of appreciation that I never had and even more important is I’ve established relationships with officers as individuals and have seen some of them engage in communities to proactively discuss changes when necessary to ensure there’s understanding of how the police is perceived by the community and possible changes to address. One might ask, “What does this have to do with Tyski and Chris?” To me, the stupidity that killed Tyski and Punkin stems from the same disregard for and lack of compassion for life that would have a police officer quickly resort to deadly force in certain situations and not others, or have a young man to thoughtlessly take the life of another within his community, or to have a jury not recognize or ignore that police authority doesn’t beget necessity to use any level of force, or that perpetrating revenge on someone that killed a friend is just as sinful and immoral as someone killing police officers who some might feel targeted and plagued by. I believe that if we face the same core problems that resulted in my friends deaths 25 years ago, fewer people will be in the situation 25 years later wondering what their friends lives would be like or how they would look because we would’ve taken action to still have them alive. Below are my thoughts on practical actions that I believe need to be taken to shift behavior and accountability to improve the lives of all citizens and establish respect between law enforcement and communities where they garner the least trust. I intentionally omitted “training” as it’s very subjective and often used as a means to exonerate or refute blame versus build bridges and relationship. Likewise, I omitted cameras because they do nothing to build relationship or increase the likelihood that officer and suspect will treat each other as human versus serve to hopefully prove blame after something has already gone horribly bad. Hopefully each individual (starting with me) can find a means to see what they can do as individuals to improve the situation prior to or in direct alignment in speaking of the shortcomings of others. None of this will change that Tyski and Chris’ families have to deal with their death every birthday, every holiday, every milestone, and every family gathering, but I pray we all engaged to make it better for others. So this year, I send my love and continued blessings to the Sharper and Gabriel families and I recommit to them and Mr. Young to continue to honor their lives. This entry was posted in Community, Family, Personal, Perspective, Uncategorized and tagged AllLivesMatter, BlackLivesMatter, ChrisSharper, CommunityActivism, EricGarner, Ferguson, police, TyskiGabriel on January 1, 2015 by lamillsgarrett.